More than just Canada’s national animal, beavers have long been recognized as the engineers of the forest. In building their dams they transform their natural environment into a thriving habitat for themselves and other forest animals. 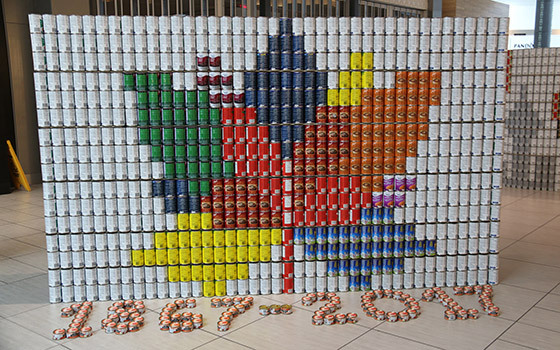 Our structure this year celebrates the strength of our country and its people. MTE’s engineers are proud to build our own dam to transform our community into one where no one goes hungry. 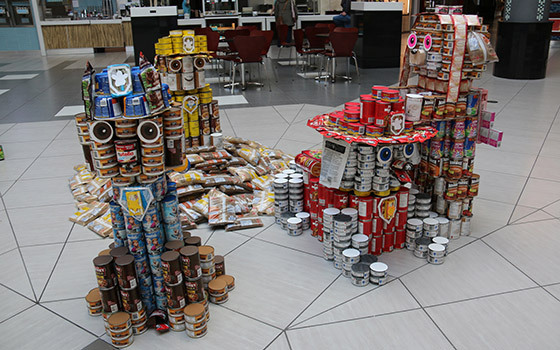 NCR has a long history of supporting The Food Bank, dating back to “Zehrs nights” to internal competitions and now with the Canstruction food drive. This year we decided to reference good health that comes through nutrition to fortify our bodies. Hunger is a vicious cycle that makes learning difficult and creates a cycle of poor employment. With NCR’s commitment to being a strong community member, we choose to help break the cycle of poverty and hunger, helping to build a future of successful well-nourished people. In 2017, the University of Waterloo celebrates its 60th anniversary. We have a rich history of giving back to make our community a better place to live. 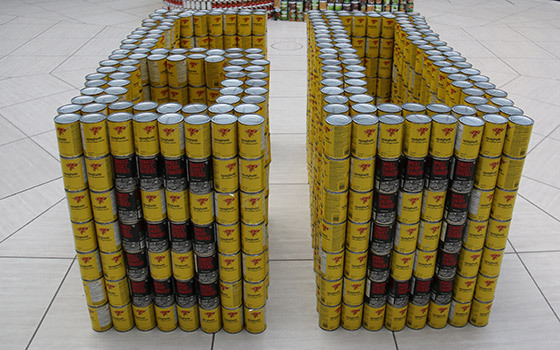 Through our partnership with The Food Bank of Waterloo Region, the University helps raise awareness of hunger and the need for food, both on campus and in our community.Join us in celebrating our anniversary throughout the year, with #UWaterloo60. Celebrating Canada’s 150th Anniversary – The train was the key to making Canada the country it is today! The train provided access to areas of our country and people that were previously unreachable. It not only brought food but also other supplies and goods needed to grow and develop into a unified and productive country. Today, many years later, trains continue to deliver needed food and suppliec across great land, similar to how The Food Bank of Waterloo Region delivers needed food and hope across our region. 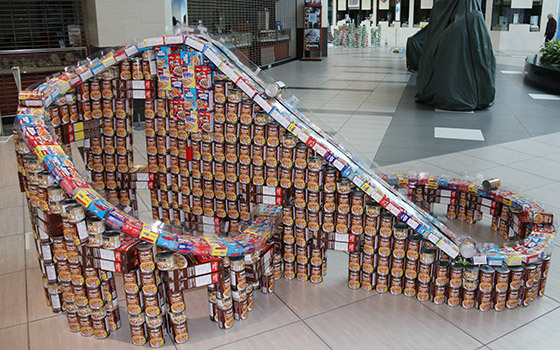 The Paw Patrol Gang jump into action to Rescue the Food Bank of Waterloo Region! 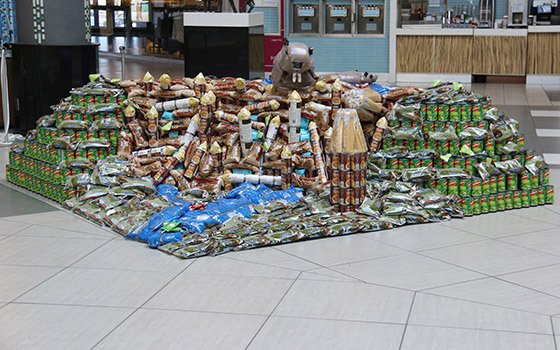 Chase, Rubble, Skye, and Marshall, work together as a team to save the Hungry People of Waterloo Region! Collecting and Delivering Healthy food for all! This year Canada celebrates 150 years as a nation, and we believe one of the things that makes our country great is our passion to help others and support those in our community. The Food Bank plays a big part in that and ensures that Canadians have access to wholesome and nourishing food. 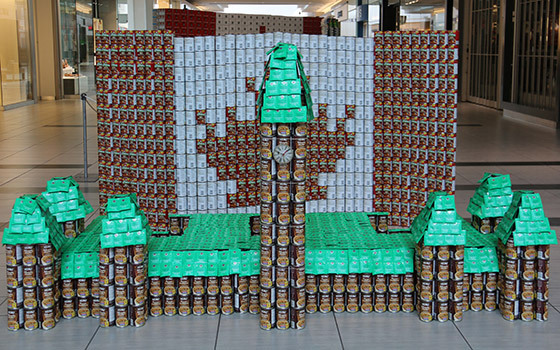 We are proud to support The Food Bank of Waterloo Region and we are proud to be Canadian! 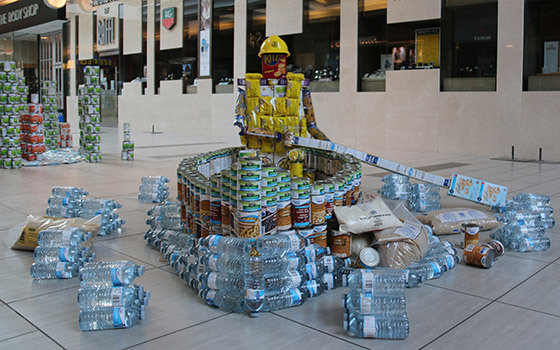 We chose this structure because it was “Canadian themed” with the canoe, but also it represents ending hunger by sinking the metaphorical hunger boat! Canada is a country that was built, and continues to grow, on diverse cultures and communities coming together to support and help each other. 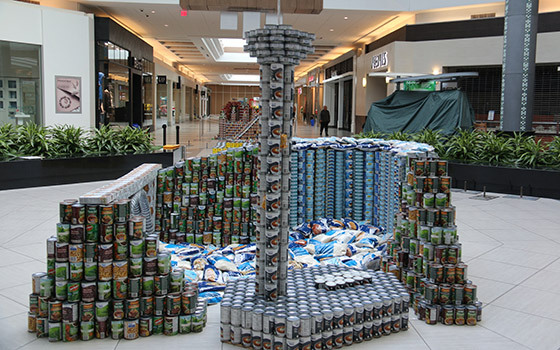 Canstruction is anotherevent that exemplifies this, where communities and donors have come together to do their part to help battle hunger and support each other. 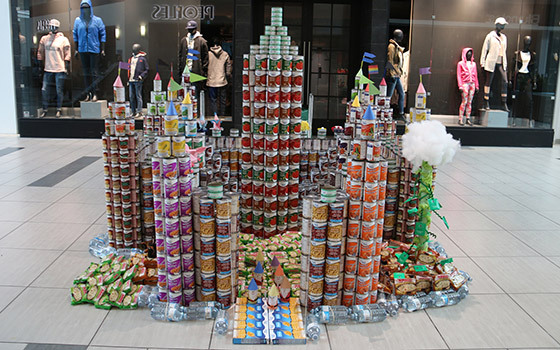 Have a fun and safe Canstruction! 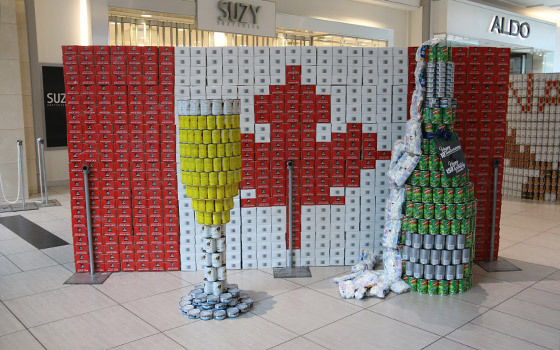 We raise a toast in celebration of 10 years of Canstruction. Ten years of bringing people together to feed families in our community. Ten years of ever more diverse and impressive structures to draw attention to an ever increasing need, here, and around the world. Feeding those in need is a part of who we are as Canadians, whether it is locally for the food bank, or globally as peacekeepers or disaster relief workers. As Canada celebrates 150 years as a nation, may we never forget, that it is Canada’s compassionate and giving nature that is respected worldwide. Nemo was an obvious choice for our canstructure since he shares the same passion for underwater exploration as does 2G Robotics. But, Nemo is also known for being loyal and caring, characteristics that are fundamental to a healthy community. He is an example that intimidating challenges can be overcome with the help of your friends. 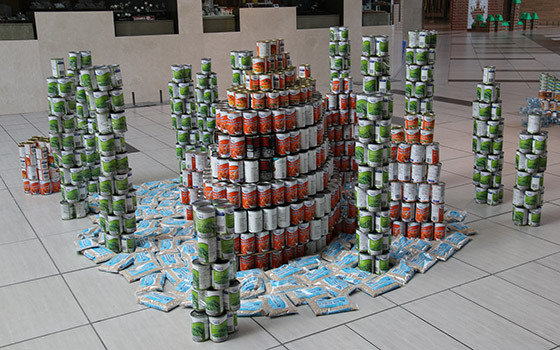 We hope Nemo’s story will help to inspire our neighbours to work together to put an end to local hunger. Canada celebrates 150 years, a tremendous milestone for our country with a long list ofaccomplishments for all Canadians to be proud of. However, one thing we still need to work on is eliminating hunger in our communities. Let us work together to make sure that no one goes hungry. Our strength is in our generosity and compassion for our neighbours, together we CAN make a difference! 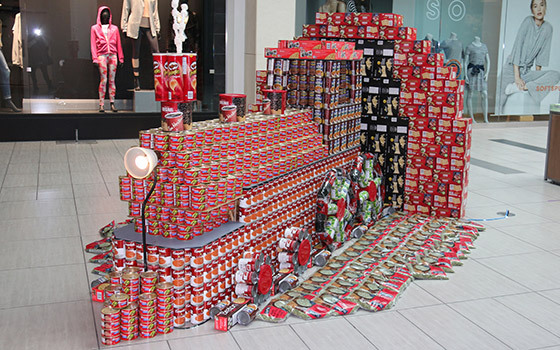 For WalterFedy’s 9th annual CANstruction build, we proudly present “Rolling over Hunger”. The Roller Coaster design we’ve created is constantly in motion. 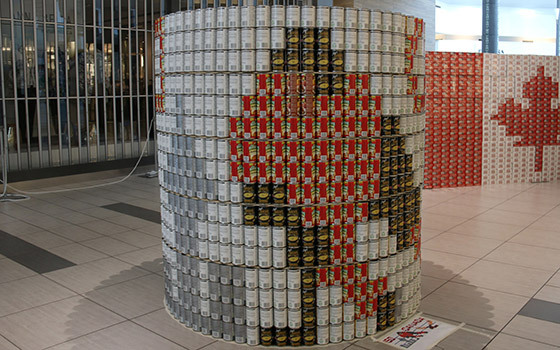 The never-ending rolling can represents the tireless efforts of The Food Bank and their volunteers. Time and time again they ‘roll over hunger’ and bring meals to those who need it most. We all have a unique story; it is part of what defines us. Sometimes our story is happy all the way through, and someimes it is a mixture between happy, sad, fortunate, unfortunate, and everything in-between. 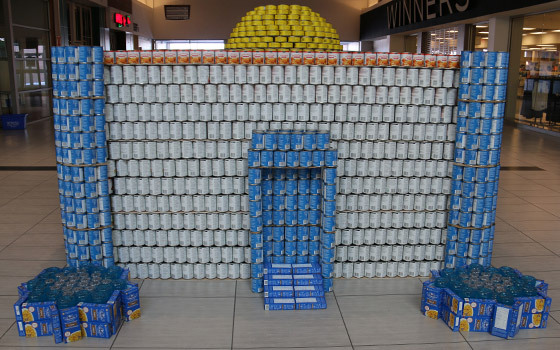 Organizations like The Food Bank support people when their story isn’t going well, and we are proud to be supporting them with Canstruction. We’ve sprinkled a few stories throughout our castle – see how many you can find! A special thank you to photographer Gillian Crawford.